The Q&A Show on Homebrewing Beer and Craft Beer Podcast! Are you completely stuffed full of turkey, dressing, and homebrew?! We know we are! What a fantastic Friday to be sharing with you guys! This also happens to be one of the biggest retail shopping days of the year, so you can imagine how hectic Todd’s acting right now as he is the Chief Keg Washer for Kegconnection.com! 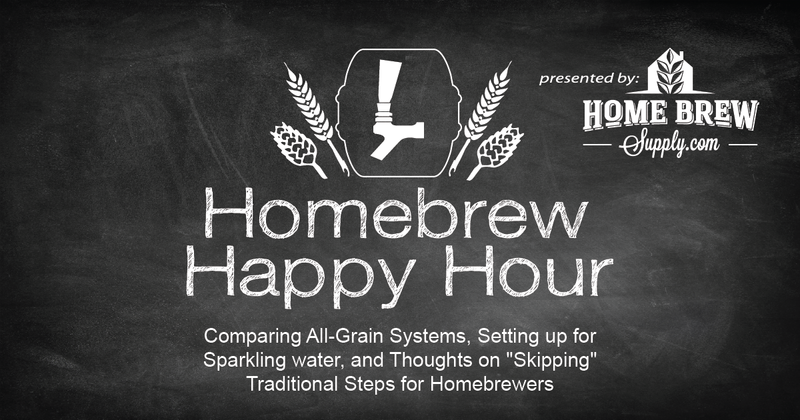 Joking aside, we have a great episode today that features your questions on comparing all-grain systems, setting up for sparkling water, and our thoughts on homebrewers who choose to skip over some of the “traditional” things homebrewers often do. As always, If you have a question that you’d like us to discuss on a future episode, please click on the “Submit a Question” link at the top of the page! Let us know what you think and enjoy the show! Today’s show is brought to you by HomebrewSupply.com! HBS’ has officially relaunched and has all of your favorite recipe kits, fresh ingredients, and homebrew equipment in stock. Homebrew Happy Hour listeners can visit HomebrewSupply.com and use the promo code “HHH” to receive 5% off your order.